A simple description of the work of a veterinarian. Color photos & color illustrations. 32 pgs. Ages 5-7. Exciting photos and fascinating facts of what is involved in veterinary medicine and related fields. Ages 8-14. 48 pgs. 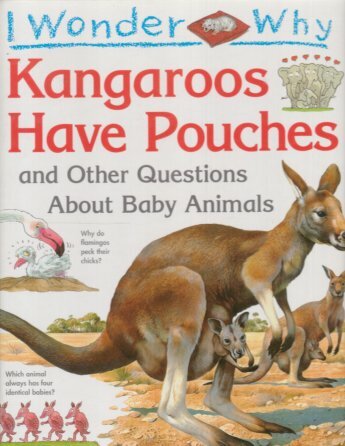 Full of lively answers to tricky questions such as: why do flamingos peck their chicks?, which animal always has four identical babies?, whose feet keep an egg warm?, which mother pretends she's sick?, which is the tallest baby?, which baby is born under the snow?, and 25 other questions about animals. Wonderfully illustrated in color. 32 pgs. Ages 4-8. A authentic natural history of the wildlife of the world - the strange & wonderful ways of mammals. Color photos, B/W illustrations. 106 pgs. Describes over 200 of the world's wild animals, from the familiar African leopards, lions and cheetahs to the lesser known Australian wombats, numbats and kookaburras. Pictures in full-color accompany the descriptions of the animals, as do helpful maps and charts. Addressed in a series of boxes are issues such as ecology, the disappearing jungles, endangered species, game preserves and national parks. Carwardine also explains how animals live in regions of extreme temperatures, such as deserts or polar areas, as well as the origin of fabled sea creatures like mermaids and the Loch Ness Monster. 64 pgs. Ages 9-12. 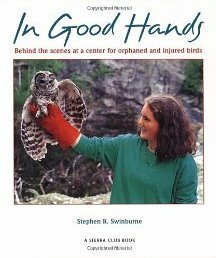 Provides a behind-the-scenes look at the Vermont Raptor Center, a facility where volunteers rescue and rehabilitate hurt or abandoned birds of prey and eventually release them back into the wild. Color Photos. 32 pgs. Ages 8-11. Colorful illustrations and intriguing tidbits about the animals native to the land Down Under. 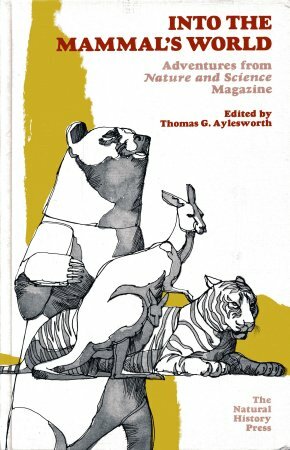 It is a selection of the author and illustrator's favorite animals of study. Each full-color illustration has information on the habitats and characteristics for each animal. 56 pgs. Ages 9-12. Nature & Science, the Natural History Press's science magazine for young readers, has for several years published articles telling of animal behavior. This book is a compilation of these artciles. Articles on: the mountain gorilla, grizzly bear, tigers, timber wolves, chimp, kangaroos, raccoons, beavers, skunk. B/W photos. 132 pgs. Ages 12-16. 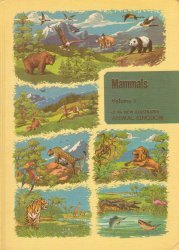 Introduces the mammals of Texas, examining such species as the prairie dog, deer, fox, beaver, armadillo, and porcupine. 111 pgs. The young conservationist's guide to the care & feeding of small wildlife. Covers: insects, fish, crabs, amphibians, reptiles, small mammals (mice, squirrel, rabbit, raccoon, skunk), wild birds, and pet shop animals. B/W photos. Ages 14 & up. 95 pgs. 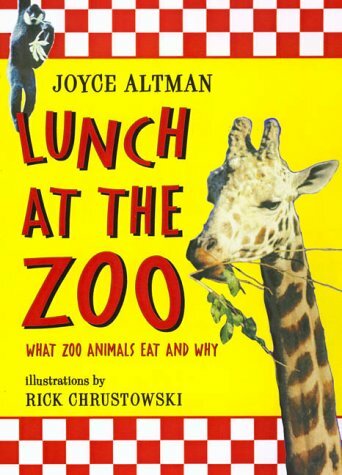 Describes how zoo nutritionists learn what to feed the animals in their care, the feeding procedures used by large zoos, and the nutritional needs of a variety of zoo animal. B/W photos & illustrations. 88 pgs. Ages 7-10. 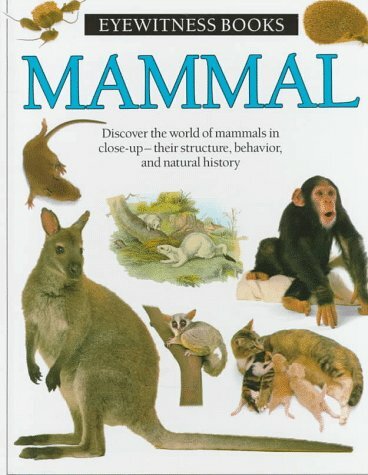 A spectacular & informative guide to the natural world of mammals. See how newborn mice develop, what a whale has inside its mouth, what the inside of a molehill looks like, learn how to recognize mammal footprints, why some animals store food in their cheek pouches, discover how camels can walk on sand, why some mammals have spines instead of fur, what whiskers are for, and much, much more. Stunning real-life photographs. 64 pgs. Ages 12 & up. Easy-to-read text, color illustrations, ideal nature book for younger reader. Do you know how whales breath, how bats locate their food, that an adult male platypus has a spur on both hind feet? The answers can be found here. Clear, lively text, close-up photographs, & orginal art make this a valuable reference book. 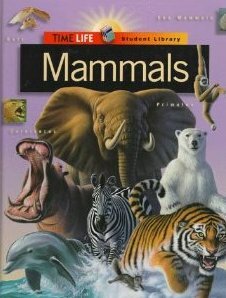 Find & compare animal species, learn new words, discover new information, see a variety of mammals, and read just for fun. Ages 6-10. 60 pgs. Describes the eating habits, defenses, parenting and social behavior of mammals. 127 pages, color throughout. Ages 9-12. Would you believe that the tiny 4-inch-long hero shrew can support the weight of a medium-sized man on its back? Travel through the animal kingdom and meet dozens of the most interesting mammals alive, shown in close-up, full-color photographs. You'll be surprised by the "amazing" things some mammals do every day. Ages 9-12. Takes a close look at the animals & plants that inhabit the mountains. Ages 8-12. 32 pgs. From the smallest single-celled organisms to the greatest mammals of land and sea, The DK Nature Encyclopedia describes in outstanding detail the rich diversity of life on Earth. Magnificently illustrated, and featuring dramatic time-lapse photographs, this compelling guide gives a fascinating insight into how living things evolve, feed, reproduce, and defend themselves. 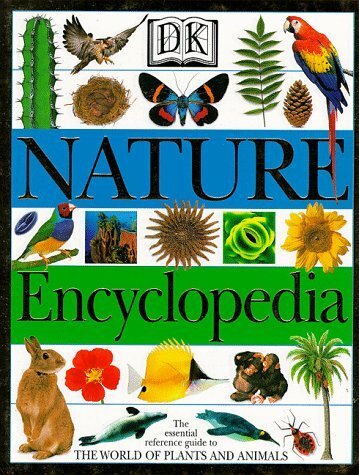 Explores each major plant and animal group, including flowering plants, birds, reptiles, insects, fish, and mammals. Thematic sections cover topics as varied as reproduction and survival, photosynthesis and communication. Also includes classification charts and a glossary of science terms. It is a perfect reference for anyone curious about organisms, ecosystems, and the scientists who study them. It's full of amazing color photos and easy-to-understand illustrations and diagrams. Ages 9-14 (great for adults too!). 304 pgs. Jam-packed with information children are encouraged to look at the pages & engage in the sticker activity. With 60 beautifully illustrated stickers it is great fun to find the exact place to stick them. And what's more, they are re-usable so the fun goes on. Ages 5-10. Meet the animals that are awake at night. 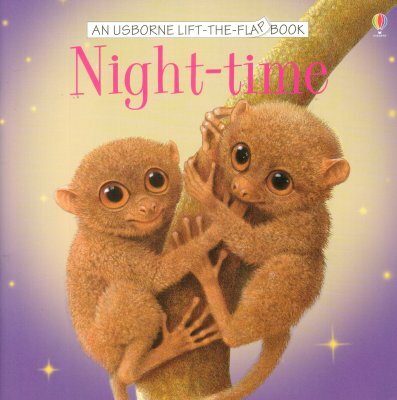 A lift the flap book. 15 pgs. Ages 4-6. True facts about small animals presented in short story form. Color & B/W illustrations. Moles, Pocket Mice, Shrews, Bats, Gecko Lizards, Musk Turtles, Hummingbirds. Ages 6-10. 32 pgs. Intimate animal photographs linked with revealing text make this a classic in the nature field. 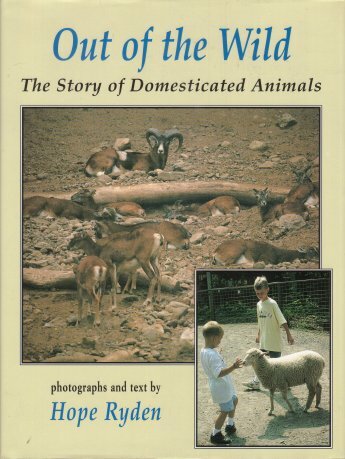 Text illustrates the daily drama of our wild animals, along with striking B/W & color photos. Some animals covered: mouse, bat, mole, squirrel, weasel, prairie dog, muskrat, porcupine, opossum, marmot, armadillo, otter, fox, badger, wolf, coatimundi, bobcat, raccoon, ocelot, jaguar, elk, bear, buffalo, and many more. Ages 14 & up. 216 pgs. How did ancient people take animals out of the wild & turn them into the familiar domestic creatures that live in our barns & houses today? Well-known naturalist Hope Ryden, traces the long story of animal domestication. Whether it was adopted to carry warriors into battle (the horse), destroy pests (cats), or entertain audiences (fighting chickens), each of the 15 animals in this book has played a key role in the evolution of human culture. Color photos. Ages 10 & up.